The Food On The Edge 2018 gathering of the world’s best international chefs and food leaders opened this morning in the National University of Ireland, Galway. 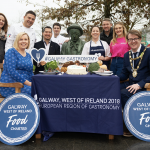 The award-winning two-day food symposium will see over 600 people in attendance over the two days, more than 50 speakers take to the stage to share their food stories, and 70 Irish food producers in the Artisan Food Village. The first day of Food On The Edge 2018 opened with JP McMahon (Founder and Director of Food On The Edge) in conversation with this year’s joint MCs, chefs Matt Orlando (AMASS, Copenhagen) and Sasu Laukkonen (Ora Restaurant, Helsinki). The theme of Food On The Edge 2018 is Conversations, and day one of the symposium saw important conversations take place around the challenges and opportunities within the industry. This year for the first time Food On The Edge is holding a series of hands-on Masterclasses for delegates led by selected speakers. Today saw Adrian Klonowski and Matylda Grzelak (The Use of Customs to Convay the Food Identity of a Place or Culture); Matt Orlando (No Such Thing as a By-product, Only Another Product); and Joshna Maharaji (Social Gastronomy in Public Institutions: Triumphs, Challenges & Big Lessons). Delegates to Food On The Edge also got to experience the Artisan Food Village which showcased food and drinks from 70 top Irish producers. A pop-up Charlie Byrne’s Bookshop is also acting as a hub for signings and sales of titles authored by the speakers. The 2018 Food On The Edge venue is the Bailey Allen Hall at the National University of Ireland Galway (NUIG), Ireland. The masterclass sessions will take place in the O’Donoghue Centre next door. The event starts at 9.00am on both days. 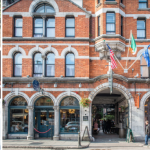 Follow the official hashtag #FOTE2018 for regular updates..